Really get to grips with your data by having PivotPoint perform a range of mathematical functions. The total value of sales for each of your products this year. The average number of cases each of your customer advisors is handling in a day. The percentage of unpaid invoices that are more than 60 days old. PivotPoint can handle all these and more. Output the results of your calculation as a chart or a table, or both, and keep you up to date with changes in the situation as your list data changes. 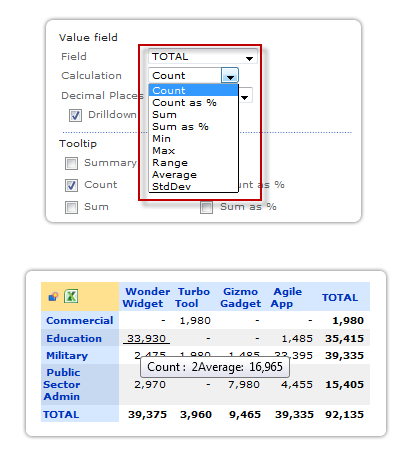 With Tooltips in the table view you can view a number of calculations simultaneously, saving so much data analysis time and effort. We need to confirm your email address so we have just sent you an email.